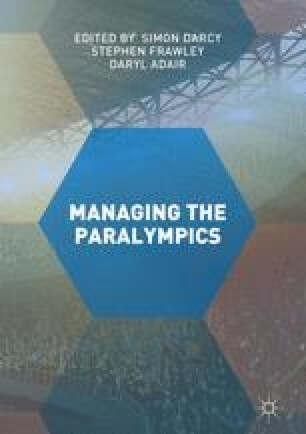 This chapter explores the emergence, role and function, and characteristics of media management in the Paralympics. It combines a critical disability studies perspective with approaches to sport drawn from sociology, media, communications, and cultural studies. By sketching a reconstruction of the development of media in the Paralympics since its inception, and supported by in-depth interviews with leading disability sport media practitioners and administrators, we offer a characterization of the “full service” media management that has evolved in the lead up to 2016 Rio de Janeiro Paralympics. We argue that Paralympics possess a history that is indivisible from the political voices, everyday experiences and wellbeing of disabled citizens and communities. This history needs to be respected and acknowledged both in media and through its management in future Paralympics. Australian Research Council (ARC) Future Fellowships awarded to Gerard Goggin (FT130100097) and Brett Hutchins (FT130100506) supported the research presented in this chapter. Thank you to Alison Anderson for her assistance in the organization of the interview data presented in this chapter.